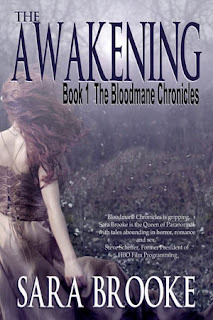 The Awakening by Sara Brooke is a paranormal romance that was given to me by my publisher. It was the first romance I have read with a ghost as the romantic lead and that made it engaging. Sara Redmane is a likeable woman. She is a quiet, bookish girl who prefers to live in the worlds that exist in the pages of a novel to the real world. Sara’s life is turned upside down when she goes to visit her friend Bobbie Trillo in Georgia. Sara is immediately confronted by the visage of a strange man staring at her from a window that should be empty. Sara tries to explain her vision away, but it becomes impossible to ignore the ghosts of Trillo House when they come to her that night. Ms. Brooke’s novel unfolds from here delicately intertwining romance and mystery. Ghosts and spirits thrive in Georgia and Sara is forced to confront both in her friend’s family house. The most engaging ghost in this story is the ghost of a mysterious and darkly handsome man who Sara feels herself drawn towards. This ghost warns Sara that danger is lurking around every corner of the Trillo family house and that an evil is trying to destroy the Trillo family. Sara is determined to save the family from this evil. Ms. Brooke’s writing style is clear and steady as she guides the reader deeper into the mystery at the heart of the haunted Trillo house. Ms. Brooke’s novel is a little more romance driven than I usually read as I usually prefer ghosts and demons to true love, but the book is engaging and the romance is passionate. I enjoyed this book immensely and would definitely suggest it for anyone who loves paranormal romance.